Andy Smith, Charlotte magazine’s digital director, and I created this list of our favorite albums from local bands from the past two years. This was published in Charlotte magazine’s March issue. Each track on Dirty Art Club’s 2017 album feels like 100 songs wrapped into one. That’s largely because each one is—the local psychedelic act samples old, obscure records and splices the beats together to create one trance-like song. Clocking in at 23 tracks, Basement Seance is impressive not only in length but also in its ability to intertwine genres and remain approachable for all listeners. My editor’s note from Charlotte magazine’s March issue. Cover image by Jonathan Cooper. IS THERE anything promptu about seeing a show at Snug Harbor? For every band I’ve seen at the Plaza Midwood venue, it’s always been a last-minute decision: If the set starts at 10:30 p.m., I’m calling the Uber at 10:28. An interview that was published in Charlotte magazine’s March issue about local rock band, Hectorina. HECTORINA KICKS OFF its Snug Harbor residency this month on Feb. 6, ahead of the release of their new album, Knotted Everest. The local DIY rock group’s fifth full-length record is moodier than Hectorina’s past pop punk style albums, but that’s just a part of the band’s mission: to constantly evolve. Charlotte magazine spoke with frontman Dylan Gilbert in January about Hectorina’s new album and about the city’s—and Hectorina’s—ever-changing sound (edited for clarity and space). Charlotte magazine: What’s the inspiration for the name of the album, Knotted Everest? Dylan Gilbert: A lot of our earlier work was more colorful and more psychedelic, but the stuff we’ve been thinking about and writing about now are more anxiety-driven. Just thinking about our current time, it can be more stressful. Knotted Everest is this enormous thing all tangled up. CM: How has your music evolved in Hectorina’s seven years? DG: I think that a lot of artists find what they like, and they want to stay in their realm. Of course that’s OK, but our M.O. from the very beginning was let’s keep going. Always asking, what’s next for us? A lot of the time, whenever we put stuff down on paper, we’d already be onto the next thing stylistically or creatively before the other thing released. Maybe it’s hard: The people who like our band, can’t keep up with us, but hopefully that could be a good thing, too. My editor’s note from Charlotte magazine’s February issue. CLUMPS OF HAIR fall to the floor as Deborah Triplett buzzes off her brown locks with an electric shaver. Bright red lipstick frames her wide smile. “It feels so liberating,” she shouts over the sounds of Janet Jackson’s “What Have You Done For Me Lately.” Triplett holds up a clump, takes a look at it, and says, “What have you done for me lately?” She shrugs and drops the hair to the ground as if tossing a piece of garbage into the bin. On October 12, Triplett was diagnosed with lung cancer—one tumor the size of a lemon in her right lung, one mast in the center of her chest the size of a child’s hand. The doctors showed her the X-ray—the mast’s veins stretch like extended fingers—and gave her a 35 percent chance of survival. A feature story I wrote for Charlotte magazine’s January issue. It’s 4 p.m. on a warm Halloween at Solstice Tavern, a NoDa bar that, appropriately enough, is only a few days away from its own sudden death. A group of 10 or so gathers on the back patio, a collection of empty Pabst Blue Ribbon cans growing on the bar top. Just a few hours ago, most members of the crew lost their jobs at the city’s only alt-weekly paper, Creative Loafing. Ryan Pitkin, the paper’s last editor-in-chief, totters around the patio, snapping photos with colleagues and friends who showed up to support, and to drink. Every few minutes, Pitkin’s phone ka-chings like a register about to devour dollar bills. It’s his Venmo account filling up with donations from concerned friends and sympathetic fellow journalists. One writes, “You’ll do great things in the future, but tonight, just have a beer.” Others consist of simply a beer emoji. A few feet away, associate editor Courtney Mihocik vents about her recent move to Charlotte three months ago; at 23, she had relocated from Ohio to work at the paper and doesn’t know where she’ll go from here. Justin LaFrancois, an account executive, seethes as he recounts packing up his office. John Grooms, an original editor and longtime columnist, stops by and gives a speech of thanks as AC/DC’s “You Shook Me All Night Long” blares through the cigarette (and e-cigarette) smoke. “It’s been nice,” he says, and salutes the team. Womack gathered them in the conference room and told them that, after 31 years of publication, they had just produced their last issue of Creative Loafing. They were fired. Womack gave members of the seven-person staff five minutes to clear out their belongings and leave. “No severance. No nothing,” Pitkin tweeted a few minutes later. My editor’s note from Charlotte magazine’s January issue. Cover image by Peter Taylor. DAVE CRANDALL can tell you anything about the cocktails from The Summit Room. Want something fruity but not too sweet? Try the Kilimanjaro, one of its seven cocktails named after the tallest peaks on each continent. “I’ve been in the business forever,” says Dave, a server at the Dilworth restaurant. He glides across the dining room floor with a Cheshire Cat smile, explaining the must-order drinks—and dishes—to every customer. The thing is, though, he’s never had a sip of any of them. For our Best New Restaurants list, I wanted to talk to a server who has seen the changes in Charlotte’s food scene—someone with a different perspective from chefs and food writers. When I sat down with Dave at Mama Ricotta’s in November, I figured I could still write that story. But I didn’t want to. There was more to Dave than the food industry. 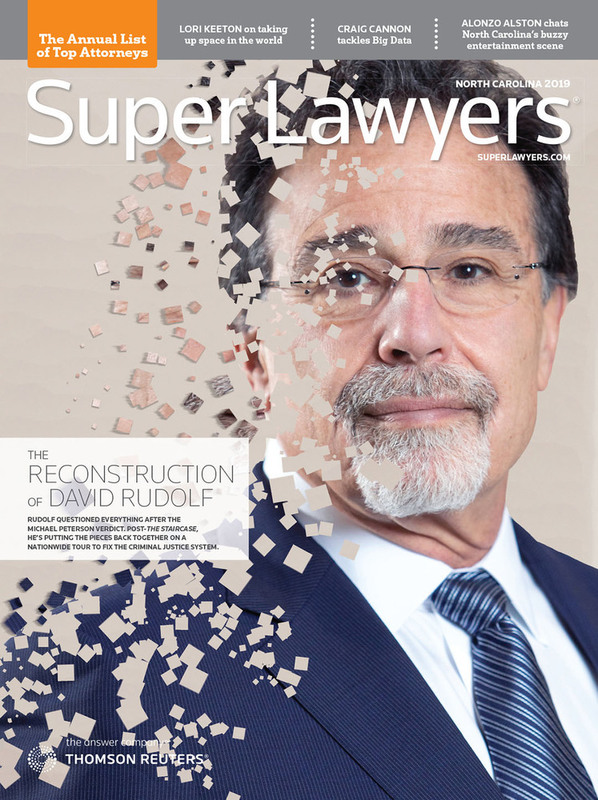 A cover story I wrote for Super Lawyers magazine about David Rudolf, the lawyer who defended Michael Peterson in the famous case which was featured in the Netflix documentary series, The Staircase. On a 911 recording, Peterson’s voice wavers frantically. Fifteen steps. Or is it 20? “She fell down the stairs,” he says between tears. “No, she’s not conscious.” His wife’s body lays at the bottom of the stairs, blood pooling. “Please,” he begs, three times. The call ends with a blaring dial tone, like a heart monitor flat-lining. When help arrived, investigators saw the blood at the bottom of the stairway. That much blood? From a fall down the steps? Peterson became a suspect in the alleged murder of his wife. “It just never made any sense,” says David Rudolf, the attorney Peterson hired to represent him. My editor’s note from Charlotte magazine’s December issue. Cover image by Logan Cyrus. I HAVE ONE VIVID, recurring nightmare. It’s the night before Christmas, and I’ve completely forgotten about the holiday. I haven’t gotten gifts for anyone; I haven’t spent hours making sure the bows are tied symmetrically. Cookie dough is still just a bag of flour, uncracked eggs, and a container of sugar. I’m stuck in Charlotte eight hours away from home in Delaware. I panic and drive to the mall to grab last-minute gifts, but the stalls are all shuttered. CVS for gift cards? Closed. I think I could re-gift something from home, but my closet is suddenly empty. Every year, Charlotte magazine names a group of Charlotteans of the Year, made up of individuals who changed the city that year. I wrote about Sil Ganzó, the executive director of ourBRIDGE, a nonprofit that helps immigrant and refuge children (and their families) settle in Charlotte. CARS RUMBLE over Central Avenue’s potholes and whiz past Deli St.’s porch, as Sil Ganzó speaks of her first few years working with the local refugee and immigrant community in an after-school program a few blocks west on Pecan Avenue. Photo by Anthony, a 4th grade student at ourBRIDGE. Sil Ganzó poses with Preston, another fourth grader. My editor’s note from Charlotte magazine’s November issue. Cover image by Peter Taylor. ON MOST SUMMER DAYS at my neighborhood pool, there’s a never-ending loop of bass playing from a small portable speaker. It’s music made for glow sticks and kegstand handstands as a horde of spring breakers cheer. At this small pool in Plaza Midwood though, the club soundtrack often jolts me awake from naps or forces me to dog-ear whatever I’m too distracted to read.